As a new driver, you only have a limited amount of time before you experience one of the major hassles of owning a car: a breakdown. Breakdowns happen to everyone over a long enough timeline, including those who follow all the appropriate steps to maintain their cars. When this troublesome scenario eventually occurs, you will want to have a trustworthy mechanic already picked out. If you don’t, the pressure to get your car back on the road may lead you to take it to the first shop you see, possibly resulting in a less-than-ideal repair job. Although there are many talented and honest mechanics out there, the industry as a whole is known for being a bit shady. Many mechanics will take advantage of people who they think are uninformed about cars, and unfortunately, young people are often included in this group. Finding a trustworthy mechanic and being assertive throughout the process of getting your car fixed is the only way to ensure that you part with the least amount of your hard-earned money possible. The good news is, once you find a mechanic, you can continue to build a good relationship over time, and eventually, you will have no worries that your car will be well taken care of. This is probably the easiest way to find a good mechanic. Ask your parents, your parents’ friends, your teachers and other trusted adults in your community who they use when they are having car trouble. Many of them have been driving for years and have likely suffered more than a few breakdowns. If any of them recommend a good mechanic, it’s likely that you can trust that person too. When you get a nice list of potential mechanics to choose from, give each of them a phone call. Ask about diagnostic prices, the price for an hour of labor and whether there is a written warranty offered for their services. All reputable repair shops will give you a 90-day warranty, but ideally, you will want to get a lifetime warranty on all repair work. Before you leave your car in another person’s hands, it’s a good idea to investigate whether the business has ever had any problems satisfying customers in the past. The Better Business Bureau will have a record of any complaints or lawsuits that have been filed against the business, and if you do a quick search on Google, you should be able to get a nice list of reviews. Keep in mind that there are two sides to every story, and one bad review doesn’t necessarily mean that the mechanic was in the wrong. However, if you see more negative than positive reviews, and you notice any mentions of thievery, bad service or other unpleasant encounters, you will probably want to move on. When something seems fishy, it probably is. Trust your gut when talking to potential mechanics, and let your intelligence guide you. 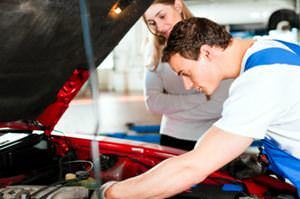 Putting in the time and effort to find a great mechanic will pay off in the long run. The older your car gets, the more likely it will need repairs in the future. Choosing the right mechanic you can trust will only make your life easier.